What will you find at our 10th annual free Water Festival coming Saturday, May 20, to Central Utah Gardens in Orem? From 10 a.m. to 2 p.m., we’ll give a nod to the past with the heritage plants in our gardens. We’ll also bring you up to the present with Public Outreach Coordinator Monica Hoyt’s hourly pH experiments and give you a peek at the future. No, we’re not dragging out a crystal ball or stirring tea leaves into a cup of hot water. This is so much better! 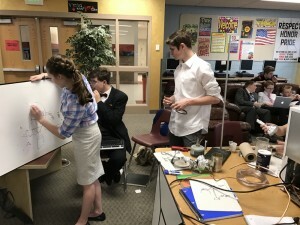 Students from American Fork Junior High’s earth science class will exhibit the prototypes they developed through the school year, offering possible solutions to Utah’s future water crisis. It all started when science teacher Lisa Allphin, eager to introduce Utah’s water issues to her students, arranged a field trip with CUWCD to the Jordanelle hydroelectric plant this past fall. A gathering of mentors from several organizations further whet the students’ interest, leading to the long-term partnership with CUWCD and Vivint. These are the problem-solvers of our future, Hoyt added. “They’re going to be the ones in the workforce dealing with these issues. We’re so excited to show the community our future is in good hands,” she said. The Water Festival typically draws young families, a perfect audience for the American Fork students. The school will send three teams: Hoyt’s team is working on desalination, Maloy’s is redesigning faucets with 3-D printers and Vandemere’s is creating a sprinkler-sensor system using robotics. We’re also celebrating our 10th anniversary with fun activities, prizes and free hot dogs! Afterward, you’ll leave with new ideas for conserving water at home and outdoors. Don’t miss this exciting and entirely free event. See you on May 20!